You may think that putting your dog in a [amazon_textlink asin=’B00QAVNYGK’ text=’crate’ template=’ProductLink’ store=’fosterpack-20′ marketplace=’US’ link_id=’11026041-1327-11e7-b7d6-93aaabfd820f’] is unnecessary, or mean. But it’s not. Once your dog is crate trained, he/she will come to love the crate. Our dogs lay in theirs whenever they want to escape the puppies, or other dogs. A few of them won’t sleep, even naps during the day, if they aren’t in their crates. It’s like their own bedroom, their own space. They all have blankets and beds in them all of the time. And usually a Nylabone, or stuffed Kong, if I’m going to be gone for than an hour or two during the day. 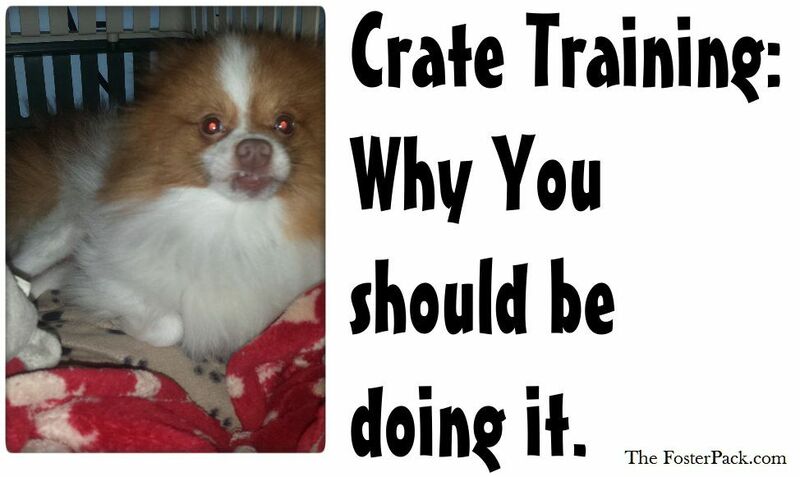 Crate training is good for your dog, you and your home. And I’ve never come across a dog that can’t be taught to actually like their crate, given time to get used to it. If not to a crate per say, then at least be [amazon_textlink asin=’B001OC5UMQ’ text=’gated’ template=’ProductLink’ store=’fosterpack-20′ marketplace=’US’ link_id=’26867b9b-13dc-11e7-b617-a132691d2126′] into a small dog proof room. In our multiple dog household, each dog has their own crate. And when they’re in it, the other dogs are not allowed to bother them. And the humans will only bother them when necessary. It gives the older dogs a place to escape the younger dogs and puppies. Or to retreat to when there is too much stimulation going on for them in the house. Some of the dogs hate the vacuum, they usually retreat to their crates when I start it up. Other’s aren’t overly fond of strangers, they head to their crates when we get company. We even have one foster dog now, that prefers to eat in his crate, away from the other dogs. Fireworks, and gunshots close by (We live in a very rural area, people like to target practice out here, so gunshots are common.) send most of the dogs running to their crates. The day a guy totaled his truck, and landed in our yard, the dogs were in the crates before I even knew what was going on. They apparently heard the accident before I did. It was very helpful, as all of the first responders started showing up and there were people, trucks and equipment everywhere. To our dogs, their [amazon_textlink asin=’B000P9TNLI’ text=’crates’ template=’ProductLink’ store=’fosterpack-20′ marketplace=’US’ link_id=’2908bc30-1327-11e7-abb3-7940afa31df4′] are definitely their safe havens. Keep your dog safe while unattended. No more chewed up walls, shoes, garbage, etc. Dogs can get into so many different things that could possibly be dangerous for them inside the house, household cleaners, electrical wires, counter surfing, etc. But when they are safely confined to a crate, with a destruction proof toy, you don’t have to worry about them getting into anything. No more messes to clean up when you wake up, or get home. Dogs are den animals by nature, they don’t like to potty where they sleep. So crate training is a big help in housebreaking puppies. Which keeps your house a whole lot cleaner. Traveling with your dog is much easier if they are already crate trained. Not only for the car rides, but for nights and time alone in strange surroundings. Their crate goes with them, like their own traveling bedroom, making them feel much more secure. Dogs are also much less likely to get hurt if they are crated on car rides. Sudden stops or sharp turns can throw a loose dog into the seat backs, or doors. During a car accident, being crated (or tethered) makes it less likely for the dog to run off. Obviously, crate training like this doesn’t work well for large dogs, but they should at least be securely tethered to a seat belt or door handle. Hotels are also more dog friendly if the dog will be crates when unattended. So are friends and relatives who may let you use their guest room. The dog also feels much more secure in his familiar crate, in a new place. If your dogs are anything like mine, they sometimes play rough, and get hurt. Their crates are a great place for them to rest and recuperate from any injuries, or illnesses. And it’s a lot easier to keep an injured or sick dog confined to a crate, if they are already crate trained. Over all, crate training is great for both you and your dog, when it’s done right. Such as never using their crate as a punishment.